Kind of looks like Stephen Fry to me. I guess because I was watching Jeeves and Wooster last night. I wasnt watching any Stephen Fry related programming last night and he was the first person I taught of when I saw it. Must be Stephen Fry. Or someone with the same nose. 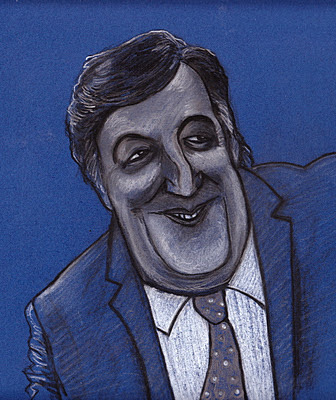 Stephen Fry!!! I was lucky enough to meet him in London outside National Theatre after Frankenstein. My first thought was Stephen Fry, too. Great pic! Love the study in blue! Makes me think of the TARDIS-oh, there's an idea... You should draw the man who makes the sound of the TARDIS. I bet he's handsome. @Sarah-L-B I hope you are all right now. You made me sorry for having write it... I just could not help it. Sorry!!! i wish i were as artistic as you. WHY ARE YOU SO TALENTED?! YOUR TALENT! It hurts so good. Again, I love the way you put colours. Wow, the resemblance is uncanny! Fantastic work!